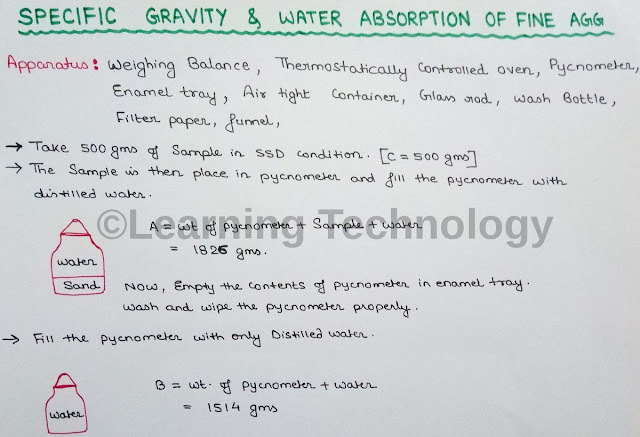 The object of the experiment is to determine the Specific Gravity & Water Absorption of Fine Aggregate by using Pycnometer or Specific Gravity Flask. 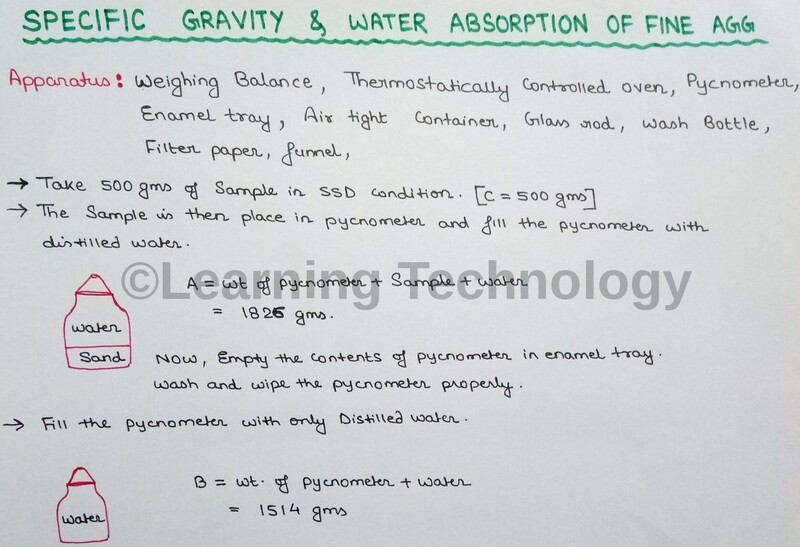 Specific Gravity is the ratio of the mass of unit volume of soil at a stated temperature to the mass of the same volume of gas free distilled water at a stated temperature. 1. Take 500 gms of sample (Sand) in SSD (Saturated Surface Dry) condition. 2. The sample is then placed in Pycnometer and fill the Pycnometer with Distilled water properly. Now, empty the contents of pycnometer in enamel tray. Wash and wipe the pycnometer properly. 3. Fill the Pycnometer with only distilled water. 4. The water form the enamel tray is removed by decantation in a beaker. Again the solution form the beaker is passed through filter paper with the help of funnel in another beaker. The total sample (sample left in enamel tray + sample left in filter paper) is then placed in an thermostatically controlled oven at 100 degree celcius for 24 hours. After 24 hours the sample is then allowed to cool in air tight container. Now note the weight of oven dry sample.